Brukers pBDi uses a sandwich electrochemical ELISA procedure for the highly sensitive and fully automated detection of all kinds of biothreat agents (bacteria, viruses and toxins). 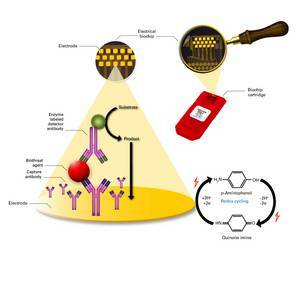 Antibodies immobilized on gold electrodes attached to electrodes of a biochip facilitate the specific capture of corresponding biothreat agents from an applied sample. The detection of the captive biothreat agents is realized by measuring the electrical current of an enzymatic redox reaction.The current correlates to the amount of target bound to the specific antibodies. Up to 6 biothreat agents can be rapidly detected in parallel within 20 minutes assay time. The detection principle of the pBDi is based on the well established ELISA procedure combined with an electrochemical readout. Capture antibodies immobilized on gold electrodes facilitate the specific binding of corresponding biothreat agents. Detection of bound biothreat agents is realized by application of a detector-antibody-enzyme conjugate and measurement of the electrical current of an enzymatic redox reaction. The electric signal is strongly amplified in this system and allows very sensitive biothreat agent detection in approx. 20 minutes. First, the high turnover of enzymatic reaction contributes to the signal amplification and second, a redox cycling procedure built into the experimental procedure, provides an additional signal amplification. The straightforward workflow starts with resuspension of a liquid or solid sample in a supplied sample buffer. Easy-to-use ELISA-based technology:Special cartridge and reagent holder design enable safe handling by unskilled operators. 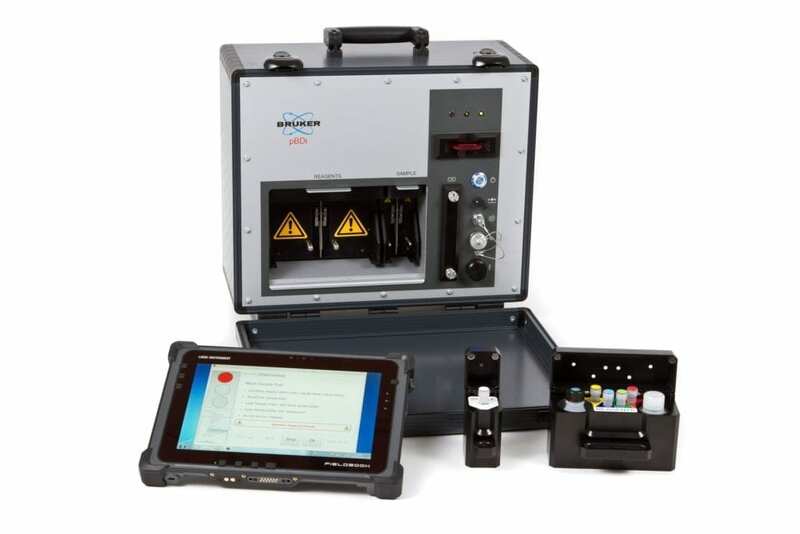 Automated sample processing and data evaluation: Wizard-based control software with fully-automated data processing and “traffic light” based result display. Outstanding test time combined with high sensitivity: Receive test results in about 20 mins with sensitivities down to pg/ml range for toxins; 10³ CFU/ml for bacteria and 104PFU/ml for viruses. Portability and possibility to decontaminate: Battery-based operation modus and suitcase integration enable field and mobile applications by first responders. Freeze dried ready-to-use kits: Enable long-time storage up to 12 months and reduce ownership costs. Open array concept: Self-immobilization protocols enabling users to create their own assays. CBRNet™ enables the exchange of data between your operations rooms and deployed CBRNe sensors, using the dedicated information system, SafeZone. At the front-end, data collected by your instrument detectors passes over whatever tactical communications system you choose. The networking technology allows for the use of mobile telephony, terrestrial and satellite radios and can harness the power of Bluetooth and WiFi connections. These advanced communication technologies are provided by Cubic Mission Solutions, world leaders in the industry and widely used by NATO special forces and government agencies. CBRNet™ utilises an open, Service Oriented Architecture (SOA) in order to ensure that you can, if you wish, easily interface its output to your existing command systems.